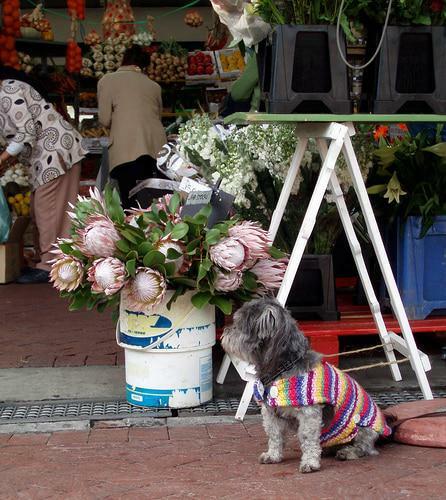 At the Neighbourgoods market @ the Biscuit mill on Saturday the flower seller brought his dog (as he always does) but this time he had the most adorable knitted jacket on. There was an icy breeze but the little fellow looked remarkably snug. The market was a good one for me which was a great relief becuase it has been very slow and the rain held off till the afternoon but wow – did it pour then. See pictures of the storm, rain and floods on News24.com. This entry was posted in Blog and tagged Biscuit Mill, cape town storm, Dog blanket, flower seller, Neighbourgoods market, proteas. The little dog looks cute.Wow…a bouget of proteas!Very beautiful.Here you could buy sometimes at a flowers shop proteas for expensive money!Anne wrote us about the storm.I will see your link.Thank you! The storm looks crazy but the market looks mellow and relaxing. I love those giant flowers.